There is the old cliché that it’s better late than never but I think in this case there is no real excuse. Of all the IT companies in the world, nothing could have been so blindly obvious, that Apple could capitalise on the connected home long time ago. Of all the big IT players in the market, Apple was pulled into the connected home (maybe dragging and screaming) Homekit should have been in its third or fourth generation by now rather than just beginning. From between 2007 and 2009 Apple changed home automation; I saw that when I wrote this. For the first time home automation became accessible and sleek, home automation was available on the iPhone, iPad and iPod Touch. Then Microsoft didn’t have a device or mobile platform that could compete, the only challenger was Google through the Android mobile. Fast-forward five years and Microsoft is ready, Google has improved and has made major stride into the connected home market. Maybe the connected home was not part of their strategy until now but back then the market need their support and they could have had a bigger impact then. Today Microsoft and Google are all over it, so Apple coming now is like an important guest coming to the party after the party is in full swing. For a long time Perceptive Automation with thier Indigo software, Savant's home automation and control Apps, Audacious Software with Shion and many others have been working on developing iOS and Apple Mac base home solutions. Now, I think they might be pleased to see Apple coming to the party; at least they should get better or more support for their platform. At the Worldwide Developers Conference, Apple didn’t give away too much but according to them the HomeKit platform will allow makers of smart home devices and solutions like thermostats and locks to connect to iPhones and iPads. 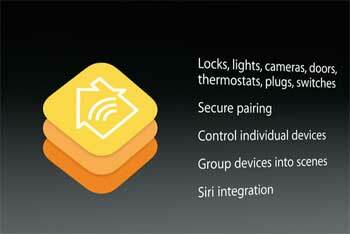 HomeKit will be part of iOS 8, the mobile operating system expected to be released to consumers in the third quarter of this year. Google already launched their [email protected] initiative across many consumer appliances and Micorosoft is doing what they can with HomeOS even the Linux Foundation (Allseen) has introduced alljoyn. The first slight indication of Apple’s intendtion to participate in the connected home space when they filed for their Location Data patent with the U.S. Patent and Trademark Office. I don’t see the homekit making a big impact now. However, I think it has a big future because the preferred platform for many providers of home automation solutions is iOS. I don’t know the figures and it could be an area for researchers but I think in terms of preferred mobile device for connected home solutions would be Apple iOS, Google Android then Blackberry and Microsoft, this is excluding providers own devices.